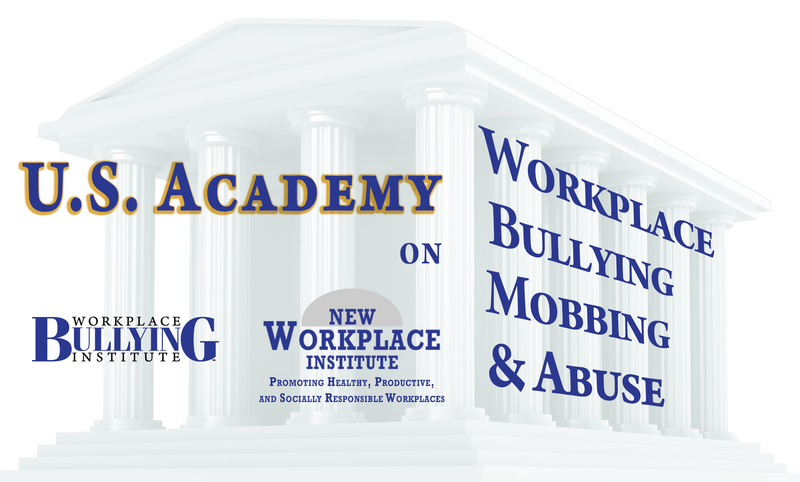 The Workplace Bullying Institute and the New Workplace Institute are collaborating on an important new initiative, the creation of the U.S. Academy on Workplace Bullying, Mobbing, and Abuse. The Academy will support and promote the multi-disciplinary work of its Fellows, a group of leading and emerging educators, researchers, practitioners, writers, and advocates who are dedicated to understanding, preventing, stopping, and responding to workplace bullying and related forms of interpersonal mistreatment. Although we recognize the universality of these destructive behaviors, we are creating this network to focus on the unique challenges posed by American employee relations, mental health, and legal systems. This initiative has been in the works for over a year, and I’m delighted to see it taking shape. The Academy’s website, to which more will be added in the months and years to come, is here. And here is the initial list of Fellows. Beverly J. Aho, M.B.A., J.D. David W. Ballard, Psy.D., M.B.A.
Teresa A. Daniel, J.D., Ph.D.
Katherine A. Hermes, J.D., Ph.D.
Melody M. Kawamoto, M.D., M.S. Paul Landsbergis, M.P.H., Ed.D., Ph.D.
USN LCDR Leedjia A. Svec, Ph.D.
« As U.S. universities embrace the New Gilded Age, what institutions will help us to grow a better society? This is a really exciting development for workers everywhere! Great minds that don’t always think alike have the potential to change the world…and workers everywhere know that the world of work needs changing. Congratulations! Kachina, thank you, it’s a very positive development. We wanted to get a terrific group of people under a big roof, so to speak, to highlight their good works and facilitate interaction. There’s more to come! Fantastic cross-section of talent! I expect this will be an energetic and powerful group! Congratulations.